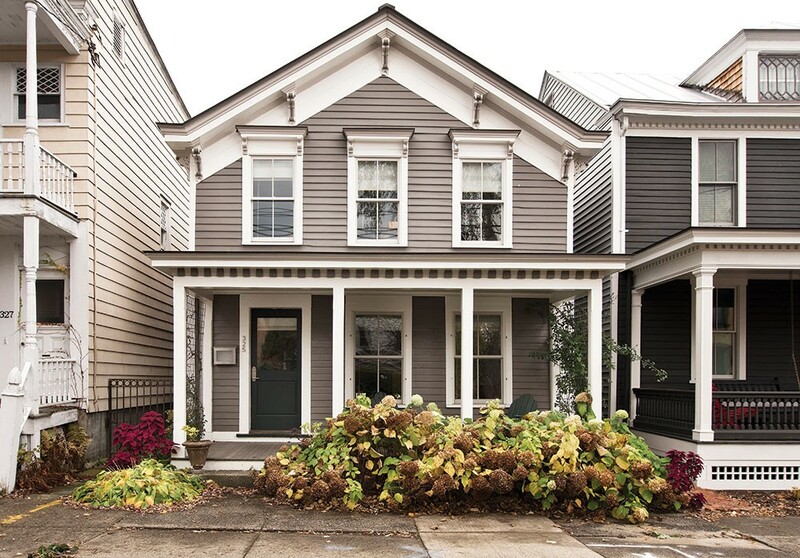 Smith restored the facade of the Greek Revival cottage with an eye for historic detail. What couldn’t be salvaged from the original design was carefully recreated. Even though she's mastered much grander designs, it was the simple, symmetrical beauty of a cottage by the river that captured architect Jane Smith's heart. The founder of New York City design firm Spacesmith, Smith has a wide body of work that includes everything from office buildings to embassy compounds to apartments and condominium complexes. The overriding creative objective throughout these projects, large and small, is to create architecture "that stands out but can remain relevant over the long term," she explains. Along with her wife, Jules Anderson, Smith has created a home that matches this aesthetic, but with a hip and historic small-town vibe. Once dubbed "Miss Macy's Cottage" by Hudsonians, the cottage's sense of having a rich, 150-year history is expertly preserved. Smith has also managed to make it a simple, elegant, and light-filled space inviting enough to sit within for long periods while wondering about all that might have transpired there over the past two centuries. A native of Wyoming, Smith graduated from Arizona State University and then moved to New York City to begin her career as an architect. Her first forays into the Hudson Valley were weekend trips upstate to visit friends. She loved the region and thought it would be an ideal canvas on which to create a home for herself, so she bought property in Chatham with ideas of building afresh. The Hudson cottage was originally meant to be just a short-term residence. Within walking distance to everything, including the Amtrak line, it was to be the perfect base of operations, allowing her to design and build her dream house on weekends while she continued to work full-time in Manhattan during the week. When Smith began renovating the Greek Revival cottage, she thought it was going to be a simple fix up. "Then I started digging and I realized I really loved the house," she remembers. Sitting on a 2,500-square-foot lot, reaching from one charming side street to another, the home dates from the 1850s and includes a small, sunny yard and the original brick carriage house. It is one part of the larger fabric of historic 19th-century cottages and elaborate Victorians that make up the surrounding neighborhood. Dating from Hudson's former heyday as a whaling capital—when ships would drag their catches up the river to the deepwater port nearby—Smith estimates the home was originally built for local workers in the whaling industry. (The nearby Victorians were intended for ship captains.) Even though the home's footprint was only 1,500 square feet, its symmetrical proportions made it feel ample. Smith knew that with a deft touch she could preserve its character while creating a cozy, comfortable living space for the modern day. After removing the interior walls, Smith added a steel beam across the ceiling to support the chimney shaft. The metal and wood entrance table in the foyer is the creation of Smith’s wife, furniture designer Jules Anderson. Anderson specializes in utilizing natural materials in a contemporary fashion, and often recycles wood from local antique shops. 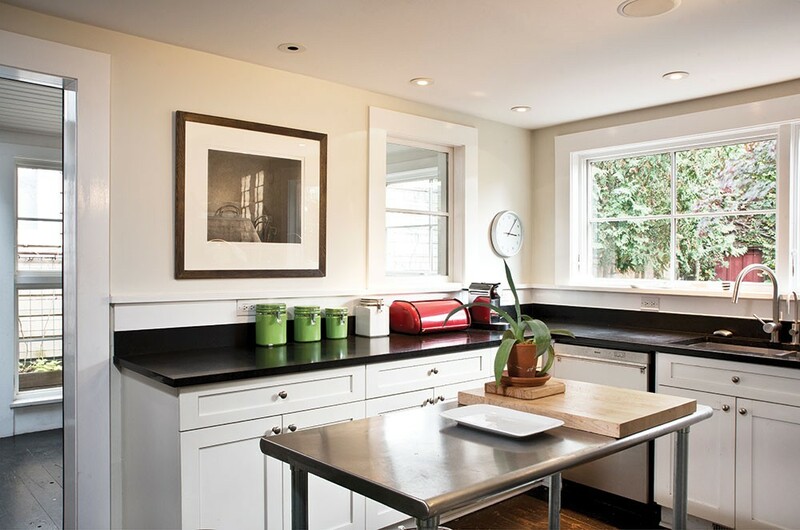 Modernizing while still remaining true to a home’s (or a piece’s) historical roots is central to both their practices. Smith's priority was preserving the home's historic streetfront while making the interior easy on the eye and livable for the long term. The home's facade features many classic details of Greek Revival cottages, and Smith tried to rehabilitate whatever she could from the original design. She restored the original covered front porch, square columns, and deep checkerboard painted cornice, as well as the pitched roof, with its ornate corbels. What she couldn't salvage she recreated, true to the Greek Revival vernacular. The traditional window moldings had to be completely replaced and the original six-paned windows were traded for larger four-paned versions. Smith also added a window to the front door. 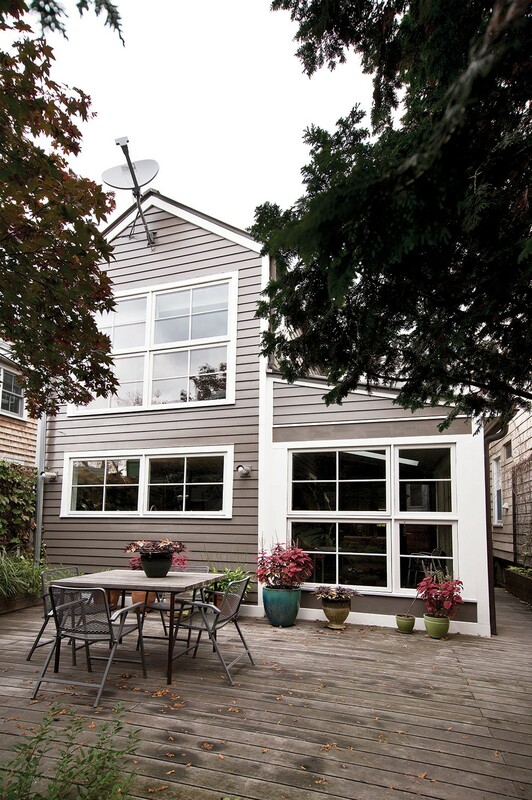 She then painted the original clapboard siding dark grey, to give the exterior dimension and add depth to the design. The facade was completed with ivy trellises and an iron gate at the entrance to the side alley. The renovation of the home's interior spaces and backside was an entirely different story. Here, Smith had a free hand to update the design but kept an eye on the home's original context. Her first priority was to lighten everything up. The original front door opened into a long hallway with doors leading to the parlor and dining rooms, and ending at the home's back kitchen. 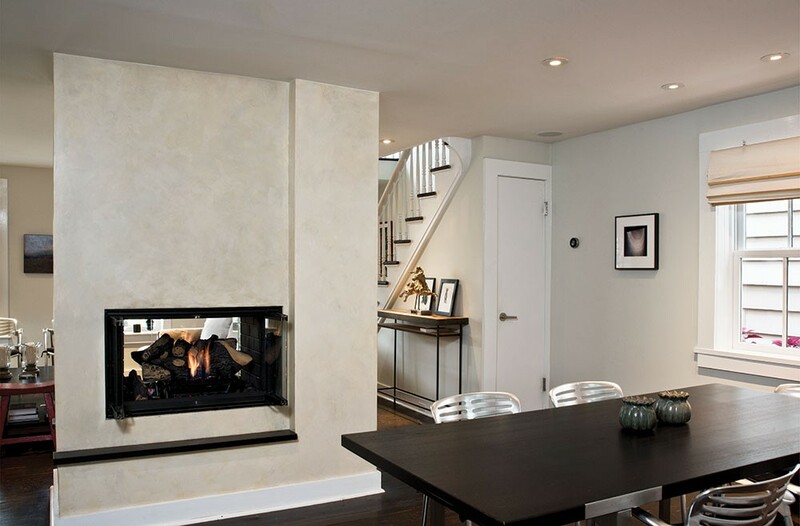 Smith removed the interior walls to create one large, open living, dining, and kitchen area, and then added a two-sided fireplace at the center. Along the opposite wall the home's original spindle staircase leads from the entranceway upstairs. By tearing out the back wall and gutting the entire kitchen, Smith created a modern space infused with light. She installed a horseshoe of grey granite counters and stainless steel appliances as well as two rows of south-facing awning windows. 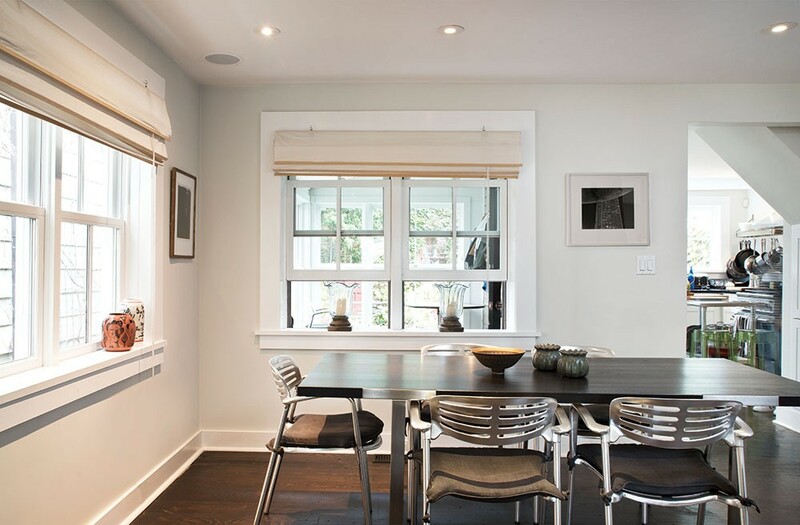 Adjacent to the kitchen, a covered back porch was enclosed with glass and fully insulated—it now serves as a three-season sun porch and dining room. 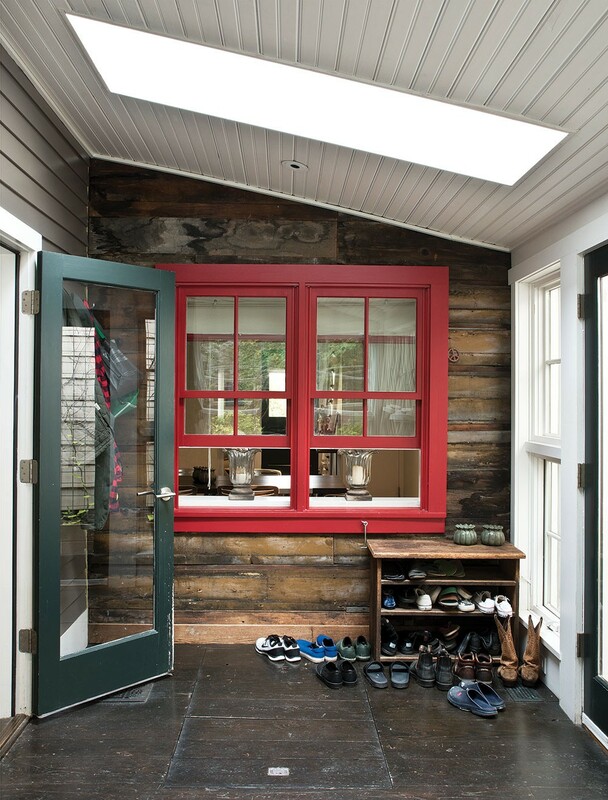 A thermal glass door between the kitchen and porch allows the space to double as a mudroom in winter. A deck between the porch and carriage house extends the living space further, serving as an outdoor room in the summer. With the historic facade preserved, Smith was free to remake the back of the home, maximizing both light and views. The space flows graciously from historic front to contemporary rear, and easily between indoor and outdoor spaces. The living room is decorated with a mix of contemporary and antique pieces. “We really tried to keep it anchored in Hudson; the furniture is historic but true to the home’s character,” says Smith. The home's second story was added to by subtraction. By removing sections of the ceiling-floor divide over the front staircase, Smith was able to draw light, and the eye, upward. 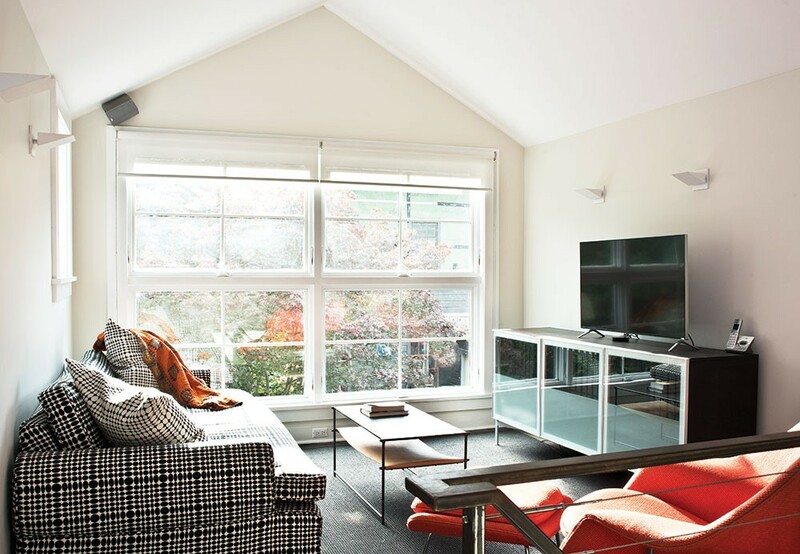 By raising the second-floor ceiling to the pitch of the roof, Smith created loftiness in the front bedroom, landing, and backroom den. A second bedroom was reconfigured by changing the windows from east to south and Smith added a large central master bath. By "borrowing" salvageable floorboards from downstairs, Smith was able to preserve the entirety of the home's original dark-stained, wide-plank wood flooring throughout the second story. Above the kitchen, the original bathroom was torn out. In its place, Smith created a bright, airy den. 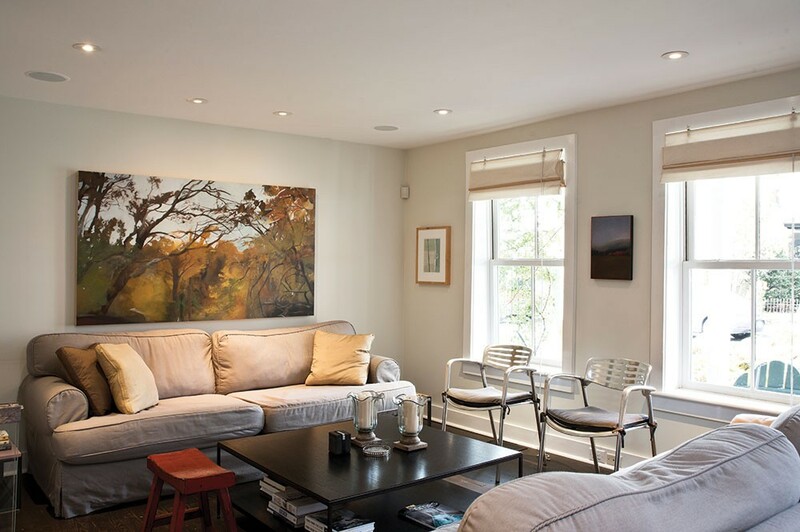 A wall of awning windows floods the room with light and offers views of the back garden and carriage house. An original back staircase, updated with modern metal and wire railings, allows the space to flow easily back downstairs into the kitchen. Smith added awning windows in the back of the house overlooking the garden, deck, and carriage house. The windows give a feeling of open space to both floors. “Even in a rainstorm we can keep the windows open and feel the outside,” Smith says. The home is decorated with locally collected antiques, as well as furniture handcrafted by Anderson. A New Zealand native, Anderson was one of the original contractors hired to remodel the cottage. (In fact, it's how the two met.) Anderson's furniture line, Slowood Studios, embodies a similar creative principal as Smith's—that is taking pieces of historical significance and updating them in a contemporary fashion. 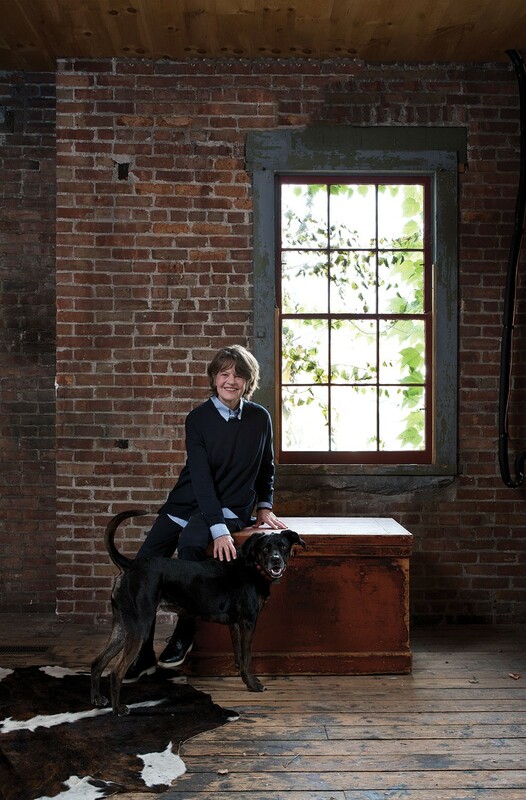 Largely self-taught, she began as an apprentice carpenter in Connecticut and then took an intensive woodworking course at the New England School of Architecture in 2006. Since then, she's handcrafted everything from dining tables to benches, beds, and chairs, all of it a singular combination of restored antique woods, metal casing, and "Kiwi ingenuity," she explains. At the back of the property, the original brick carriage house, covered in a century of ivy, opens onto both the backyard and the lane behind. Used over the past 150 years alternately for carriages, animals, and as a workshop (the home's previous resident made gilded frames in the space), the building was insulated and refurbished by Smith and Anderson. On the second floor, they added floor-to-ceiling bookshelves along one brick wall and lit up the space by installing contemporary pendant lights. While Smith didn’t add actual space to the home’s second floor, she was able to add spaciousness. Smith is inspired, in part, by Japanese architecture where a simple, contextual aesthetic predominates design. “The negative space is almost more important than what you fill a room with,” she explains. 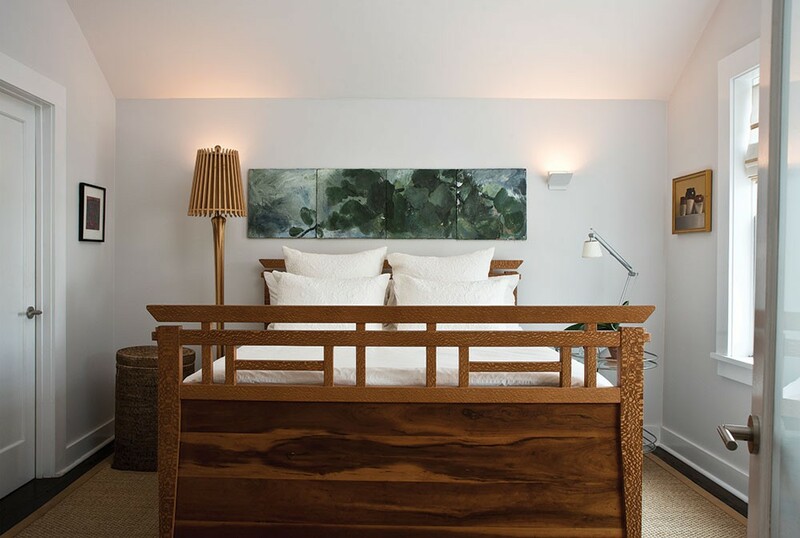 The bed was designed by her brother, Dave Smith, of Ingrain Furniture in Seattle. Originally envisioned as a work space, Smith first utilized the studio on her weekends upstate. However, as her love for the area grew, so did the space's usefulness. A few years ago, Smith progressed from weekender to commuter status, utilizing the carriage house as office space for part of the work week. 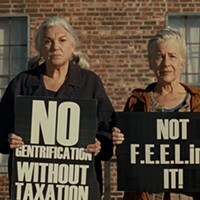 She also joined the Hudson historical restoration committee and designed or consulted on multiple local projects, helping her neighbors appreciate the modest cottages for their architectural significance and restore them into livable history, as Smith and Anderson have done. A staircase and pop-out hatch from the carriage house ceiling lead to an open-air deck, where the two often sit and contemplate the surrounding rooftops. Over the past 12 years, they've watched Hudson's revitalization, something Smith believes is at least partly due to the town's preserved architecture. In the past month, the studio below has returned to its status as a full-time creative space: Smith has opened a branch of her Spacesmith firm in downtown Hudson and will be walking to work there full time. She's excited about the change and looks forward to playing a larger role in the town's continued revival. "I really feel that we're stewards of these properties," she explains. "They've got so much history beyond the short amount of time that we've lived in them." For her own part, Smith is happy that she was waylaid by Miss Macy's cottage. "People have come by over the years who grew up in this house and everybody has happy memories of it—I think it's a happy house. It was really a good choice." Smith added an insulated glass door between the kitchen and the three-season porch as well as a skylight, allowing the home’s ambiance of interconnected indoor-outdoor spaces to remain during colder weather.